In my first article about the Structure of a Digital Image, I busted some of the myths and jargon which surround the pixels which go to make up digital images. In the second article I went on to describe how the computer quantizes the tones in an image. This third and final article in the series explains how color is analyzed. If you haven't already read the first and second articles in this series, you may find it useful to do so before you read on. In the second article in this series, I explained how to analyze tone to achieve stepless photographic quality on a computer. 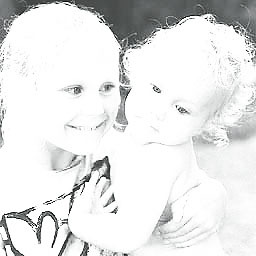 But, beautiful as good black and white images can be, most of the photographic world wants to see images in full color. Do you remember the science lesson at school when the teacher shone white light into a prism and a rainbow of colors which came out the other side? Amazing, wasn't it? I know it was one of the defining moments of my school days. How could white light be made up of so many colors? Then the teacher dimmed the room lights and shone a red light onto a white screen. Next he added a green light and, when he overlapped the pools of Red and Green light on the screen, the mixture was Yellow! How could this possibly be? Finally, he switched on a Blue light. When this overlapped the Red it made Purple, or Magenta as he called it. When the Blue overlapped Green it made a sickly Yellow green, which he called Cyan. It was truly astonishing when he overlapped all three and made White. How could you possibly mix three very bright colors -- Red, Green and Blue -- and end up with White -- no color at all? But you can! This is called "additive" color mixing. 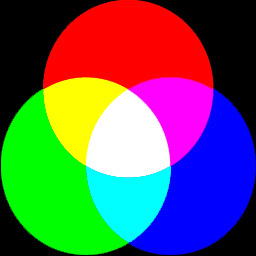 Mixing red, green and blue light produces white light -- here shown diagramatically. In practice the colors -- and white -- may not be quite so pure! 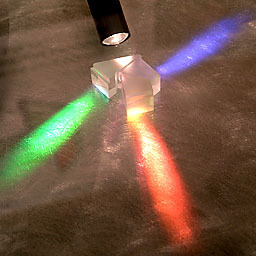 The prism block of a Foveon digital camera. White light enters at the top and is split into its component red, green and blue. 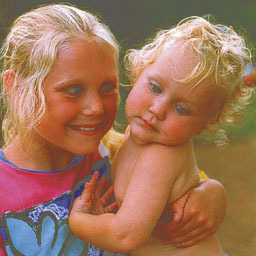 Let's return to our typical scene of a blonde girl wearing a magenta and blue T-shirt, holding a blonde baby boy. 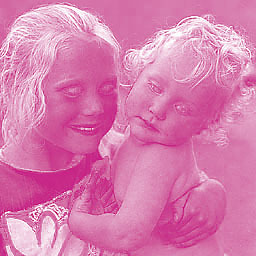 This three channel color image takes up three times as much storage space as a single channel greyscale image. The Red channel has 256 tones, as does the Green channel and as does the Blue channel. Each channel needs 8 bits to describe it -- adding up to a total of 8 + 8 + 8 = 24 bits in total. That's what's known as a 24 bit color image. 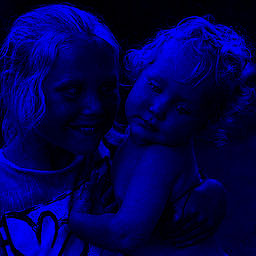 Each pixel in the image can have any one of 256 tones of Red and any one of 256 tones of Green and any one of 256 tones of Blue -- all at the same time. 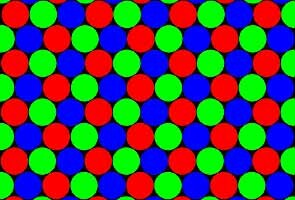 This makes a total number of color combinations of 256 x 256 x 256 = 16,777,216 colors. That's a very impressive number of colors. Ask someone if they can name them all! You can name them all with ease: Red, Green and Blue. It's just the amounts of each which vary. When we display our images on a monitor screen they are displayed as minute specks of Red, Green and Blue phosphors which glow when excited by an electron beam. There are different structures to the colored elements. Depending upon the construction of the tube, there may be dots, slots or squares. A flat screen display uses different technology, but the principle is the same. Take a magnifying lens and look at your screen. 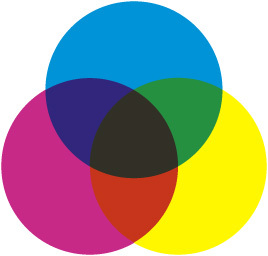 Displaying our three channel color image on a monitor screen results in the image appearing in all its natural colors. A 'shadow mask' television screen (cathode ray tube) greatly enlarged to show the structure. All the Red, Green and Blue elements are glowing equally and at maximum. At normal viewing distance this screenful would look white. The pigment or ink colors should be bright and saturated but, in practice, they are often restricted in their range of colors -- known as "gamut" -- and do not mix to produce a good black. 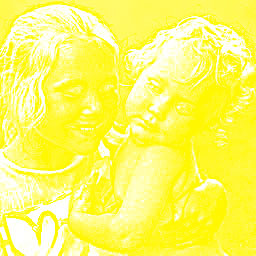 Printed in register on top of each other, the C M Y separations give an image like this one. Printed in CMY alone, the colors do not mix to produce a good black. Sure, it's 'colored', but it's not good color. To restore the blacks, a fourth channel -- K for Key, often referred to as K for BlacK to differentiate from B for Blue -- is produced. This thin black channel restores neutral tones and gives the printed image body. This is a C M Y K image. The result is much closer to the original we viewed on the monitor, though it can never be a perfect match because of the different color gamuts. The C M Y K image has four channels, not three, and so it has a 33.3% larger file size than an R G B image file. Unless you are outputting for reprographic printing with ink on paper, chances are you'll stick to R G B for images on the web, or let the relevant printer driver convert to C M Y K as required. But, if you've stuck with me this far, at least you now understand lot more about the structure of your digital images. Although 'point and shoot' may be all you need to know for most photography, just as with anything else, the more you know the more you are capable of understanding.